I was assigned to Cheesecurd in Paradise for December’s Secret Recipe Club reveal. Cheesecurd in Paradise is written by Ashley who lives in Wisconsin. I’ve actually “known” Ashley for a while now, we’re on the same cooking board together. I always love the recipes she shares there so I knew it wouldn’t be a problem to find something to make for the reveal. The problem ended up being there were too many recipes I wanted to make! Seriously, check out her recipe index and tell me you’re not hungry for at least half of those! 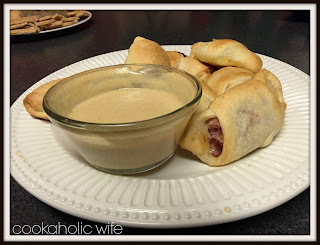 I finally decided I would make one of Ashley’s appetizer recipes for a party I recently had because I had all of the ingredients in the fridge and was looking for one more filling recipe. I also made her Spinach and Radish dip but didn’t end up getting that photographed before it was devoured. So I’ll just make it again. I was running behind the day of the party and didn’t end up pulling these Monte Cristo sandwiches out of the oven until everyone was already hovering around the food, so apologies for the less than stellar pic! If you’re not familiar, Monte Cristo sandwiches are basically a fried ham and cheese sandwich. I love that Ashley made less messy and a better finger food choice by switching out the bread for crescent rolls. 2. Unroll each triangle of crescent dough and spread a thin layer of the brie cheese. Add a teaspoon (or smaller) sized dollop of strawberry preserves on top of the cheese and spread. Roll up a slice of ham and cut in half, placing each pieces on the wider end of the triangle. 3. Roll up the crescent and place seam-side down. Repeat with remaining crescent dough pieces. 5. Meanwhile, in a small dish whisk together the Dijon mustard, mayo and honey until combined. 6. Allow the crescents to cool for 10 minutes before serving. I only made two slight adjustments to this recipe. Ashley used two pieces of the dough (a rectangle) for each of hers and I used each triangle. Mainly this is because I didn’t fully read the recipe before making it (how many of you are guilty of that?) and wanted 16 pieces so I improvised. The other slight change I made was not to dust the finished roll ups with powdered sugar. I wasn’t sure how my friends would take the combination of brie, ham and strawberry preserves but it went over really well! I was hoping to have one or two leftover to be able to photograph better, but these were gone in maybe 30 minutes. Monte Cristo Sandwiches are always so messy, this sounds like a great solution. I do recommend trying it with blackberry jam next time though (that's how I first had a monte cristo sandwich and that's really my preference). Just stopping in from group C to say great post. 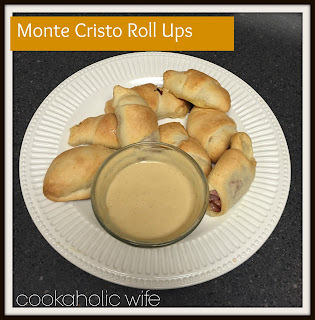 I love that you made a non-messy version of the Monte Cristo! Thanks for posting this for SRC, Nichole. What a great take on Monte Cristo! Yum.